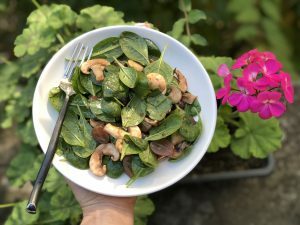 This is a great salad recipe for the fall because you can pretty much find grapes, spinach, and mushrooms all year round. The ingredients are simple: 5 ingredients for the dressing and 3 ingredients for the salad. You can serve this as a side or make is a hearty main course salad with baked goat cheese, toasted nuts or seeds, and a warm piece of toast (rye sourdough is awesome). Add the jam, mustard, and salt to your salad bowl; whisk until smooth. Add in the vinegar, whisk until smooth, then add in half of the oil, whisk again until smooth. Add in the remaining oil and whisk one more time. Thinly slice the mushrooms, add them to your dressing in the salad bowl and toss them to coat. Slice your grapes into quarters if they are large/ into halves if they are small, add them to your mushrooms, toss those as well. Finally add your spinach, gently toss to coat the leaves and serve. Serve with some toasted nuts, seeds, or even some crumbled goat cheese or blue cheese. The dressing can be kept for up to 5 days in the fridge (in a jar or airtight container), just give it a good shake or whisk it up well before use.